Bad drivers are the bane of every motorist’s life but now a new study claims poor drivers always fall into one of seven categories - so do you recognise them? 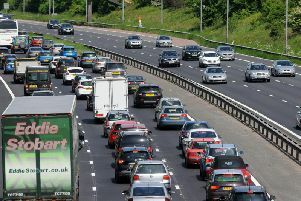 Car leading giant LeaseCar.uk analysed the data of thousands of drivers and found that those who get careless behind the wheel almost always fall into just seven types. There are thrill seekers such as Boy Racers, young males who can’t resist breaking speed limits as soon as they get their licence, and Amber Gamblers, who won’t stop at traffic lights unless they’ve been red for at least three seconds. But there are also the slow and hesitant motorists such as the Sunday Drivers, usually old people on their way to church, or the Just Passed, who may have a licence but are still nervous out there on the roads. Then there’s the Mum in a Hurry, who parks on the pavement while doing the nursery drop off, and the Know It All, who thinks he owns the road. Finally there are the Short Fuses, perhaps the most dangerous type of motorist of all to encounter, these are the drivers who fly into a road rage if you dare overtake them. Tim Alcock, of Leasecar.uk, said: “Everyone knows a few drivers who fit one of these categories, in fact it’s likely you’ll know someone who fits a few. “It could be that in reality they have a very calm and relaxed personality, but once they get behind the wheel they develop a Short Fuse and the road rage kicks in or perhaps they become a risk taking Amber Gambler. The young male driver who you’re likely to catch speeding down residential roads and committing multiple speeding offences in a souped-up high-powered car. They’re always revving their engines to try and sound like a sports car, even if they’re only driving a hatchback. Sunday is the one day of the week that these drivers spend out on the roads, often driving an old banger. Usually they’re off to church or to see their grandkids, and travel well below the actual speed limit. It can be hugely frustrating to be stuck behind one. Busy mums are always zipping about between school, football practice or dance lessons. Their car is most likely a complete tip, with sweet wrappers, muddy boots or baby changing equipment strewn across the vehicle. Parking can be tricky so they’ll think nothing of mounting a kerb or leaving the engine running on double yellows while they collect their offspring. When these chancers see the lights change from green to amber their first thought isn’t to slow to a halt, but instead hit the accelerator and prey that they miss the red light. Mostly they get it spot on, but if two Amber Gamblers meet at a junction it can be hugely dangerous. These motorists never put a foot wrong, and would be too scared to even think about driving over the speed limit. Don’t get stuck behind them on a busy roundabout, as you could be waiting a while before they decide to move. Know it all’s can recite the entire highway code from memory, and take great pleasure in pointing out mistakes and having a go at other drivers for making them. These are the dangerous drivers who can be a real menace to other road users, mostly but not always male, they regard overtaking as a personal slight and if you dare cut them up even by accident they are likely to force you off the road for a confrontation.